The candidates will be selected through a National Qualifier Test. The top 1,000 will be offered a much higher salary -- almost double of that being offered to peers. Romita Majumdar and Bibhuti Bhushan Mishra report. Tata Consultancy Services will offer 40 per cent more jobs to fresh engineering graduates during the ongoing campus placements this year, compared to last year. Stronger demand across key sectors and geographies for the company's services prompted this decision. The Mumbai-headquartered company said it would make offers to 28,000 candidates who are being selected through a National Qualifier Test. This selection process has been introduced this year. Last year, the company had made offers to 20,000 fresh graduates, who were selected through campus interviews. Jobs offers made fresh graduates by the company in 2016 and 2015, however, were much higher at 35,000 and 40,000, respectively. By going for an all-India test to screen candidates the company claimed to have democratised the selection process. It hoped to recruit the best talent across the country. For example, about 270,000 candidates from 1,800-odd engineering colleges across the country appeared for the test. Of this, 50,000 were shortlisted for interviews. The company will shortlist 25,000 to 28,000 from the first list. The top 1,000 will be offered a much higher salary -- almost double of that being offered to peers. Earlier, TCS hired new graduates from about 400 colleges through campus interviews. "The fact that we had only around a pool of 300 to 400 colleges meant that we were losing out on top talent across the country. Now, we can identify and attract these graduates from, say, the north east or remotest parts of the country," said N Ganapathy Subramaniam, chief operating officer at TCS. Usually, most of the new graduates join services during the first two quarters of a financial year. The management said trainees accounted for almost half of the 10,227 net job additions at the company in Q2 of FY19. While Subramaniam said there was a potential of following the model of selecting the candidates through national-level tests in global markets as well, the potential in India itself is huge because of the scale it offered. In addition, the test was structured such that the company was able to evaluate the strengths and weaknesses of the candidates and offer them a retest, following feedback and a training program in case they demonstrated skill in specific areas. "We believe that it is a responsibility of TCS to offer such feedback," said Subramanium. In the ongoing campus season, TCS has also taken the lead by offering much better salary to top talents. The company is offering these digital qualifiers an annual package of almost Rs 700,000, double the standard fresher salary of Rs 350,000. 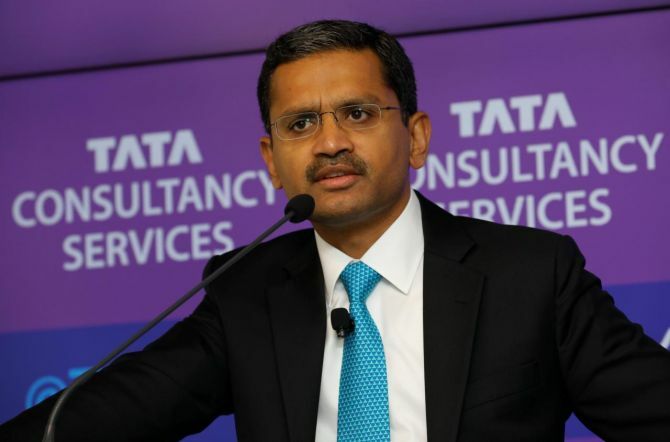 Subramaniam also said TCS had retrained its sales teams over the past few years under a massive sales-transformation initiative, parallel to the digital retraining programme that all its employees have been undergoing. Sales and solutions teams were trained to re-imagine client solutions with respect to TCS' Business 4.0 framework to enhance deal sizes by adopting digital technologies. These sales teams have been the chief drivers behind the exceptional digital and large deal numbers that TCS has been reporting over the past four quarters.